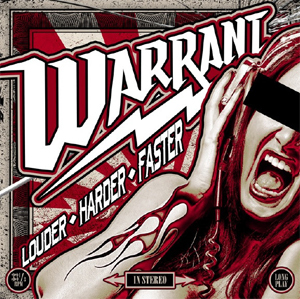 WARRANT has returned with another slab of muscular hard rock, aptly titled Louder Harder Faster, which will be released via Frontiers Music Srl on May 12th. Thefollow-up to their 2011 album Rockaholic is a gritty slab of rock 'n roll for these '80s legends. WARRANT has recently debuted a music video for the title track to the upcoming album. Watch "Louder Harder Faster" on KNAC.COM HERE. Louder Harder Faster can be pre-ordered HERE and at the links below. Digital pre-orders include instant downloads of "Only Broken Heart", "Devil Dancer", "Perfect" and "Louder Harder Faster"